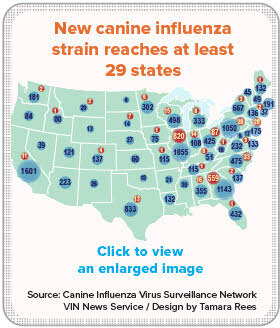 Considering ongoing headlines such as these, it would be easy for veterinarians and dog owners alike to view the spread of canine influenza virus, or dog flu, in the United States as a singular catastrophe. While the recent emergence of a new strain understandably has captured public attention, the situation isn't novel or disastrous. Dr. Cynda Crawford, a University of Florida clinical assistant professor who in 2004 helped identify the first influenza virus known to affect dogs, suggests that experiences with influenza in other species provide a guide to managing the pathogen in canines. “We should be looking at what has been well-established in people, pigs and horses,” said Crawford, who directs the Maddie’s Shelter Medicine Program at UF. Infection by influenza viruses in humans, horses, pigs and birds has been well understood for decades. The virus’ ability to spread and mutate with ease in these species is well documented, and the medical community has well-established vaccination and quarantine strategies to control outbreaks, especially among horses and humans. It was from a horse influenza virus that the first canine influenza virus, known as H3N8 CIV, evolved. The first recognized outbreak occurred in 2004 among racing greyhounds in Florida. Since then, the virus has been documented in 41 states and Washington, D.C. According to the American Veterinary Medical Association, it’s now endemic in parts of Colorado, Florida, New York and Pennsylvania. The new strain, H3N2 CIV, evolved from an avian flu. It first appeared in southern China and South Korea about 10 years ago. Dr. Ed Dubovi, director of the Cornell University Animal Health Diagnostic Center, told the VIN News Service last year that he suspects the virus entered the United States through an infected animal rescued from Asia. The domestic outbreak began in March 2015 in Chicago. Between March 8 and Feb. 2, the Canine Influenza Virus Surveillance Network logged 1,693 positive tests for H3N2. Another 12,837 tests were negative. The results aren’t comprehensive. The information is derived from 12 diagnostic laboratories participating in surveillance. At the same time, Lopez believes that the H3N2 virus is of greater concern. “When you compare the two, H3N2 is much more infectious. Within nine months, there were positive cases in half the country,” she said, adding that animal infected with H3N2 may be contagious for a longer period, as well. However Dr. Melissa Kennedy, a virologist at the University of Tennessee College of Veterinary Medicine, cautioned that at this point, any evidence of H3N2 being more virulent is only anecdotal. What are signs of canine influenza? Some dogs have died from flu-related pneumonia, but the fatality rate is less than 10 percent. Most patients recover in two to three weeks. Flu viruses are expert shape-shifters, able to take new forms abruptly. Known as antigenic shift, this transformation occurs when two different flu strains infect the same cell and combine, creating a new flu subtype, according to the U.S. Centers for Disease Control and Prevention. Kennedy, describes influenza as a chameleon, saying it takes mutation in only one host to exchange whole genes in an influenza strain. In other words, a mutation in one patient can produce a new influenza strain, resulting in an entirely new outbreak. “I expect to see new [canine] strains emerge continually, because it’s going to continue to circulate. If those mutations give the virus an advantage, they’ll be sustained,” she said. Influenza’s propensity to change raises questions about effective vaccination protocol in dogs. Dr. Alice Wolf, an infectious diseases specialist and a consultant for the Veterinary Information Network, an online community for the profession, points out that for humans, influenza vaccines are modified yearly. “They look at influenza strains that are circulating in Southeast Asia and make a guess a year in advance as to which strains will be important. That’s why they recommend yearly vaccination for humans,” she said. Vaccines for dogs are available against both strains known to infect dogs, but they are separate vaccines; none is known to protect against both strains at once. For that reason, a decision to vaccinate is something of an undertaking. According to the American Association of Equine Practitioners, two subtypes of equine influenza virus are known to be circulating in the world. Multiple strains of each subtype exist. Vaccines are reformulated periodically to protect against the most commonly reported strains. Horses that are vaccinated against equine influenza virus typically receive booster doses every six to 12 months. Crawford sees a different lesson in the horse experience from Wolf. “The AAEP states that all horses should be vaccinated against equine influenza unless they live in a closed and isolated facility,” she said. In an account of the outbreak, the New South Wales Department of Primary Industries describes using quarantine to slow the immediate spread of disease and vaccinating horses to create a buffer zone. Crawford suggested a similar tactic could be employed to curtail the spread of canine influenza in the United States, by vaccinating all dogs in states or regions with known virus, as well as dogs participating in social events. As for dog parks, Kennedy considers them “a risk, but not a high risk” for spreading canine influenza. For owners who opt to vaccinate their dog or dogs, protecting against both strains is the sensible course. Wolf, Crawford and Kennedy agreed that there is little point in vaccinating against only one strain. Maintaining protection in vaccinated dogs requires yearly boosters. After an extensive diagnostic process to trace the origin of the anteater influenza, the culprit was determined to have originated in humans. Kennedy said the event resulted in restrictions being placed on visitors with active respiratory disease. As tracking of canine influenza develops, Wolf, the infectious-disease specialist, worries about overwrought publicity leading to undue public alarm. “Assessing risk is very difficult at this point,” she said. “But I know that veterinarians are in a quandary. There are all these press releases and news media, so clients are calling them. Veterinarians feel caught in a squeeze — what happens if they don’t recommend vaccination?